This project's social and economic research is focused on economic assessment of corn-based cropping systems and gaining knowledge of farmer beliefs and concerns about climate change, their attitudes toward adaptative and mitigative strategies and practices, and what support farmers need to make decisions. 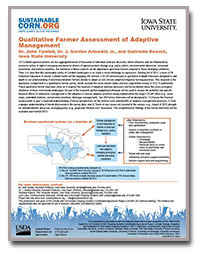 These research findings and participation in this project by farmers in the upper Midwest provide feedback for project scientists conducting field trials, analysis and modeling. Social and economic research findings will also form the framework for developing tools for farmer decision-making, education curricula and science-based policies. Dan Barker, Iowa State University, discusses research findings with area farmers at a field-based meeting. 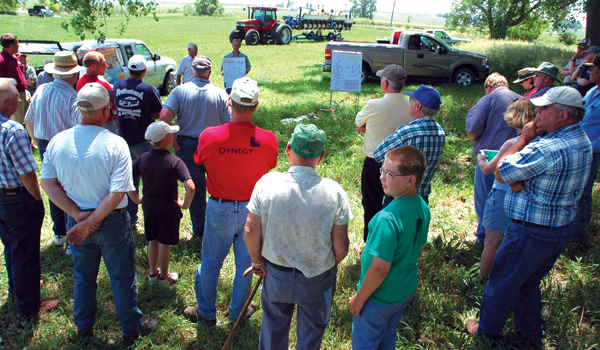 Chad Ingels, Iowa State University, discusses research findings with area farmers at a field-based meeting. 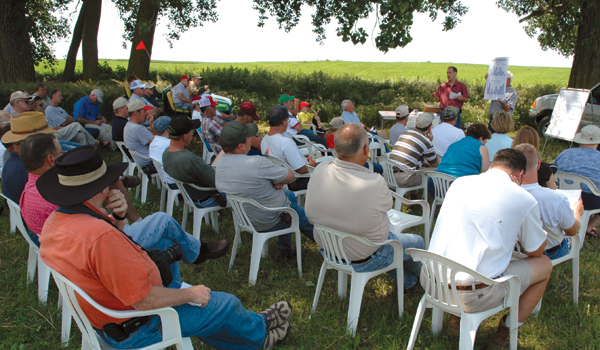 Summer meeting attended by local farmers at a research site. 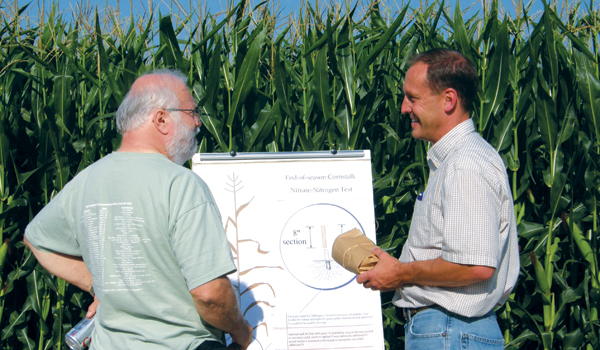 Chad Ingels, Iowa State University, discusses nitrogen sampling techniques with a farmer. 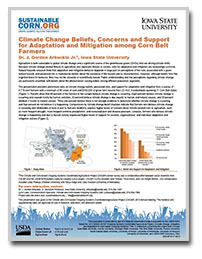 Social research conducted to-date includes a survey of farmers, to assess participants' capacity and willingness to adopt management practices and strategies that lead to long-term sustainability and productivity of corn-based cropping systems under variable weather and long-term climate changes. Project researchers worked with the USDA-supported Useful to Usable (U2U) Climate project based at Purdue University. The CSCAP survey was sent to a stratified random sample of 18,707 farmers, with at least $100,000 of gross sales and a minimum of 80 acres of corn production in 22 HUC6 watersheds. 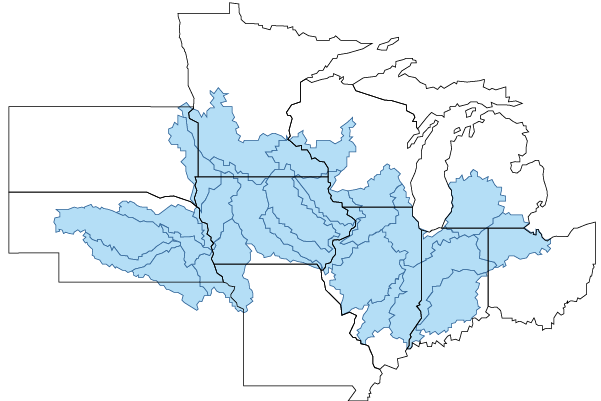 The 22 watersheds cover a substantial portion of 11 Corn Belt states, all of which are classified as "major crop areas" for corn and soybean: Illinois, Indiana, Iowa, Kansas, Michigan, Minnesota, Missouri, Nebraska, Ohio, South Dakota and Wisconsin. Farmer interviews are also being utilized for this project. University extension educators will use in-depth interviews with 200+ farmers to gather data and foster educational opportunities to increase farmer knowledge and inspire learning about connections between management practices, climate variability, soil erosion, nutrient runoff, and atmospheric, economic and environmental impacts. 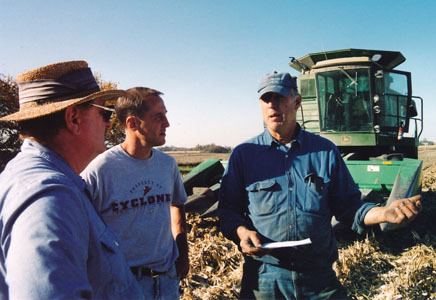 Investigators and extension educators will be conducting one-on-one interviews to examine the biophysical and financial characteristics of farmer's current operations and compare them to land-use scenarios that include various innovative, adaptive and mitigative practices that would be appropriate for their land. This approach will provide real-farm platforms for structured climate- and agriculture-related discussions between extension educators and producers. This information will help gauge farmer willingness and capacity to adopt alternative cropping practices. Farmer Survey Fact Sheet Dr. J. Arbuckle, Professor, Iowa State University, discusses the preliminary results of the farmer survey. This presentation was made at this project's 2012 Annual Meeting. Farmer Interviews Fact Sheet Dr. John Tyndall, Assistant Professor, Iowa State University, discusses qualitative research being conducted to better understand farm producer needs and costs associated with adopting management practices for resilient corn-based cropping systems. This presentation was made at this project's 2012 Annual Meeting.